The entire experience with Jacqueline and La Belle Assiette was fantastic -- from the coordination beforehand, to the preparation on the day, to the cooking in the evening. She was delightful company, and everyone at our dinner had a wonderful time. I couldn't recommend La Belle Assiette, or Jacqueline, any more strongly. Our chef was Nikki, one of Jacqueline's team. She arrived on time, was very professional in her manner but friendly also. The meal was served nicely, just as planned and was delicious. Absolutely amazing food and service. We booked Jacqueline for a dinner party of 8 to celebrate two significant birthdays. Jacqueline's food was amazing, her service friendly and enthusiastic, and she left the kitchen looking spotless. She even managed to cope with our three young children interrupting her cooking from time to time! I would highly recommend Jacqueline to anyone. We had a wonderful evening, this was our first time, a special time for our 14th Wedding Anniversary. 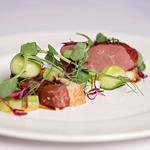 Exceptional food, beautifully presented and extremely professional service. The whole evening was seamless. We entertain a lot and have tried a number of different chefs and Jacqueline was up there with the best. We could not recommend her more highly. We had a wonderful evening with amazing food. The canapés were fun and delicious. The bread rolls were very moreish served with heavenly English butter. We loved the scallops with crispy bacon and the fillet of beef was so tender it melted in the mouth. This was then followed by the ultimate raspberry crème brûlée. Jacqueline was lovely as well as being very professional. Thank you Jacqueline - a great big 5 from us! We would definitely recommend La Belle Assiette. From the minute Jacqueline and her sous chef arrived, we were surrounded by a very relaxed and informal environment. They were completely professional, yet very friendly and chatty towards our guests. The food and its presentation was exceptional, only matched by the most amazing flavours. All our guests and us included were bowled over by the entire dining experience. I have to thank both ladies for making it a thoroughly enjoyable night, with additional thanks for playing along with the wedding anniversary surprise for my husband. I would wholeheartedly recommend Jacqueline - you will not be surprised. I wish her every success and would most certainly use her services again. A fantastic service from Chef Jacqueline - every minute detail thought of and organised. The food was superb and a great evening was had by all. This was our best dinner party ever! 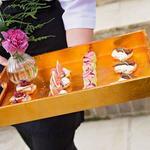 My guests were really delighted with the food and the exceptional care taken in every aspect of presentation. Jacqueline came to our place for my birthday and did a fantastic job at cooking a delicious 3 course meal (in a very small kitchen!). I would definetely consider her again for any future special events. Jacqueline cooked the two of us a very good meal and was great company. The tasting menu is interesting and well balanced: the onion bread and sea bass were particular favourites. We had a lovely dinner prepared by Jacqueline and a delightful evening with our friends. Jacqueline came well prepared and it was so nice to have her share the stories behind the recipes. If you decide to hire her for an evening, ask her to tell you where she source her rabbit. We wouldn't hesitate to recommend Jacqueline. My cooking style is flavour focussed; I love to use seasonal and local ingredients that are interesting and delicious. This is an impossible question to answer as it is always changing. I am constantly re inventing my recipes and dishes. At the moment I am really enjoying cooking spring lamb. Marinating it in garlic and anchovy really brings out the flavour. Searing it in a hot pan seals in all the delicious meat juices, while my smooth sweet potato puree and chargrilled aubergine compliment the flavours really well. Using a local English red wine to make the jus lifts the dish further as it's light and fruity. I am a private chef because good food makes people happy. Cooking is my passion; it's a creative outlet that I can never get bored with! New ingredients, new combinations and always new things to learn. Seeing my client's enjoying dishes I have designed and prepared gives me immense satisfaction. I love to sail, surf and ski. Anything outdoors suits me. When staying near the sea, catching my own dinner, foraging for some wild ingredients and cooking it back at camp is one of my favorite past times; my friends never complain either! If you believe this content violates or infringes your rights, Jacqueline Naish may not know. You could solve this problem by contacting him.